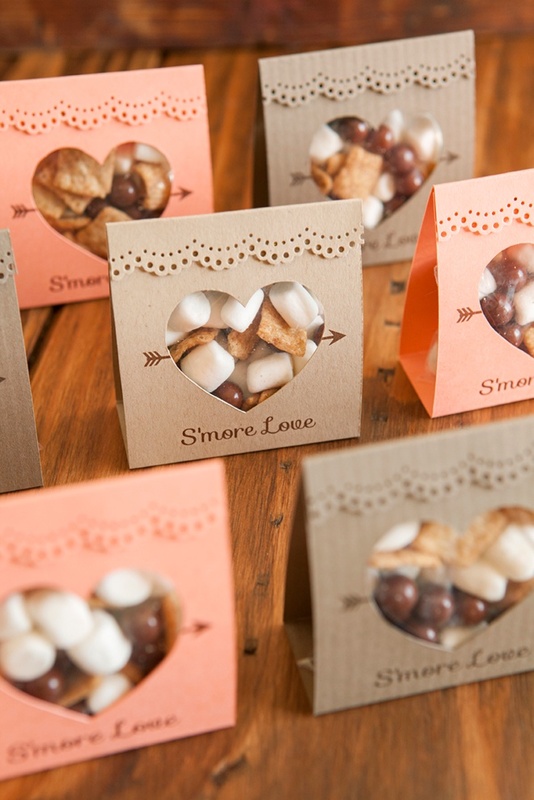 How to make these adorable S'more Love wedding favors! 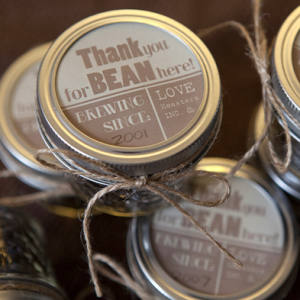 I love making favors because I love giving gifts! 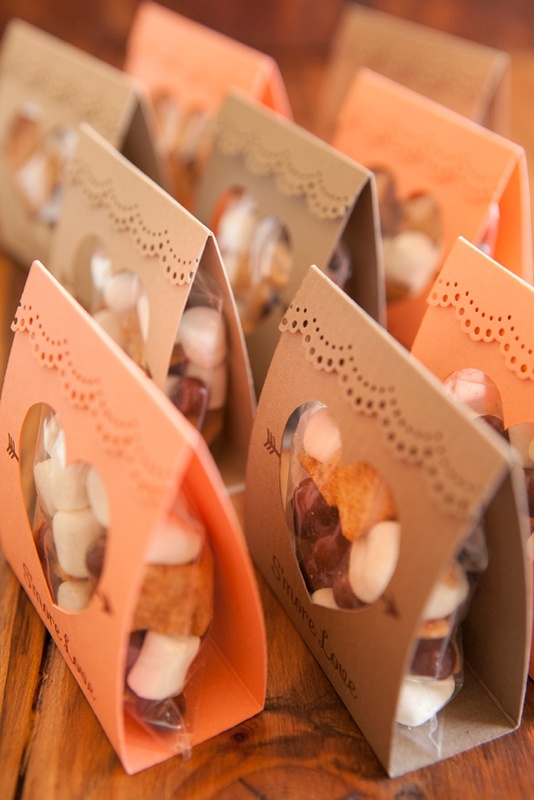 Being able to make darling mini-presents to say “thank you” for spending the day with us, no matter what the event, is not only rewarding for you but it’s an absolute treat for your guests. 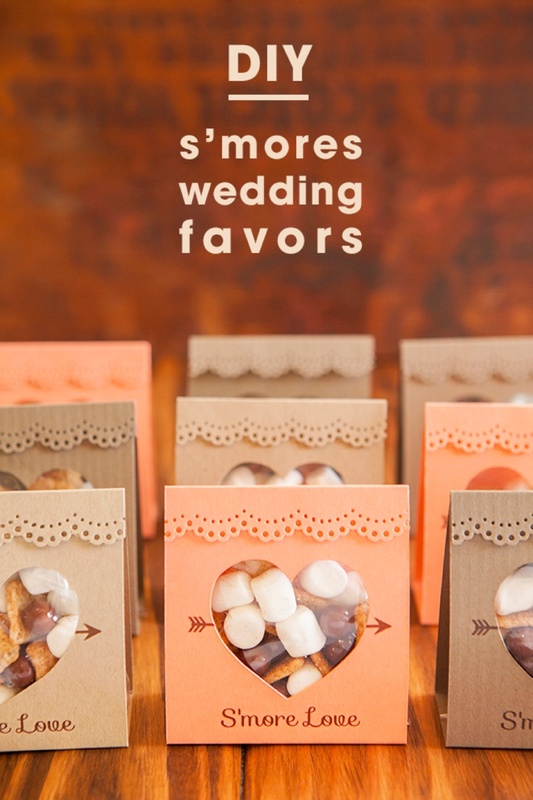 Raise your hand if you are a s’mores lover… ok, you won’t see my hand raised… but I totally get it. They are nostalgic, american, adorable… and they feel like summer but taste like fall. 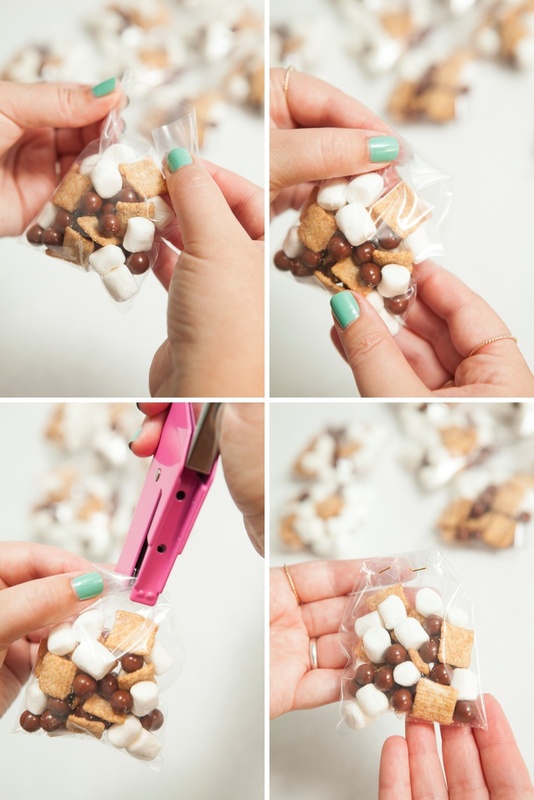 I’m really not a fan of the regular old s’more – but I’m crazy for the flavor profile and love recipes like this and this. 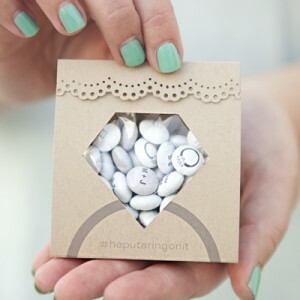 Since you guys went a bit crazy for my Diamond Ring Candy Pouch favors I shared a few months ago, I figured that turning them into S’mores Wedding Favors was a logical idea. 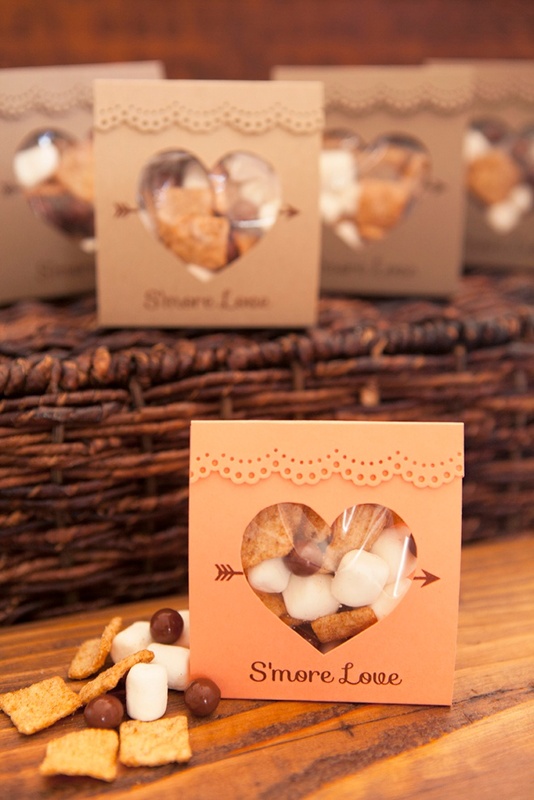 Make up some s’mores trail mix, customize my editable design, grab your bridesmaids and get to crafting! When tackling a large DIY wedding project like favors I always recommend enlisting some help by throwing an assembly party with your favorite gals. 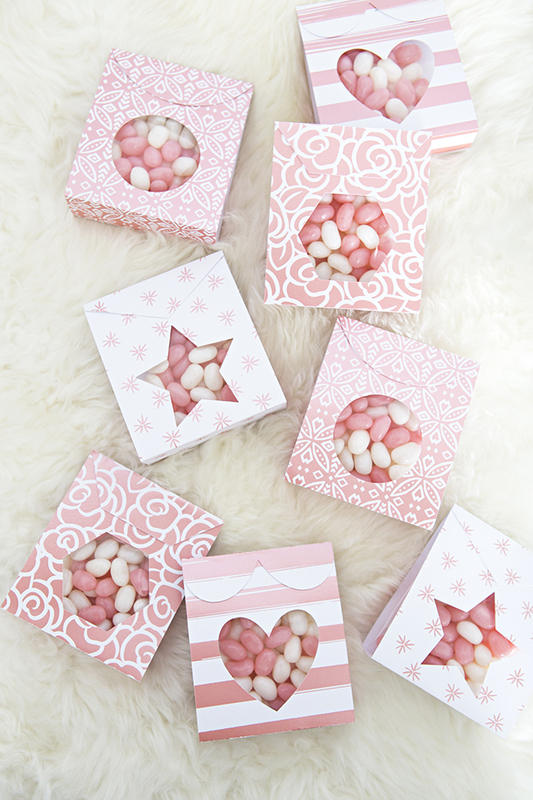 Your little gifts will come together quicker with more hands, you’ll laugh and enjoy each others company and then you’ll be able to look back on that fun time for years to come. Our FREE download design at the bottom of the post! 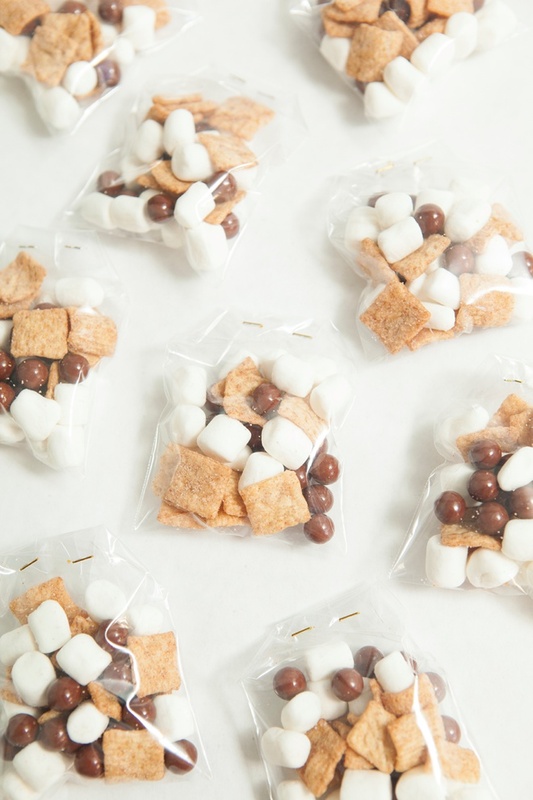 Here I mixed up Cinnamon Toast Crunch, Brown Sixlets and mini-marshmallows! 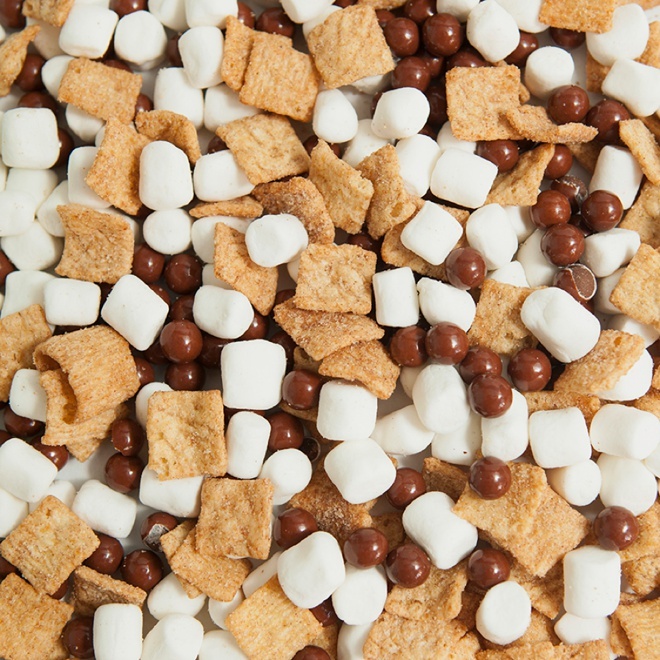 You can put anything you want in your s’mores mix though… maybe mnm’s, teddy grahams, or other yummy things. 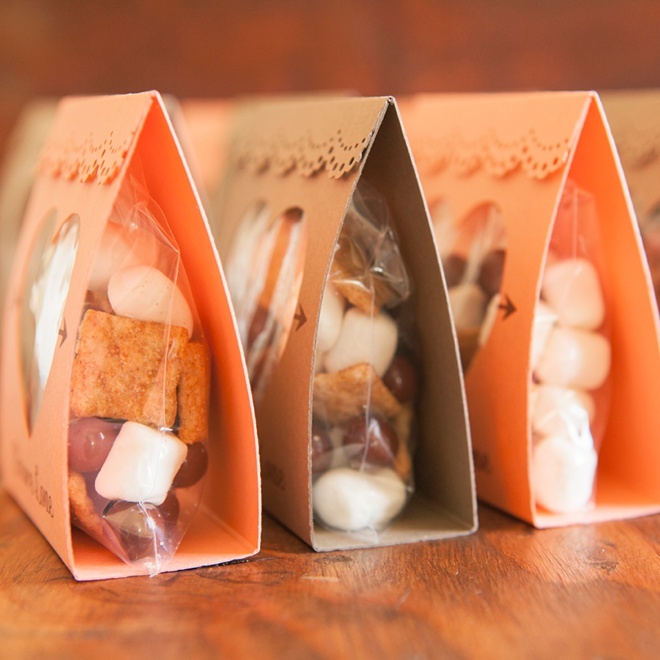 Each of the 3″ x 4″ treat bags will take about 1/4″ cup of s’mores mix. 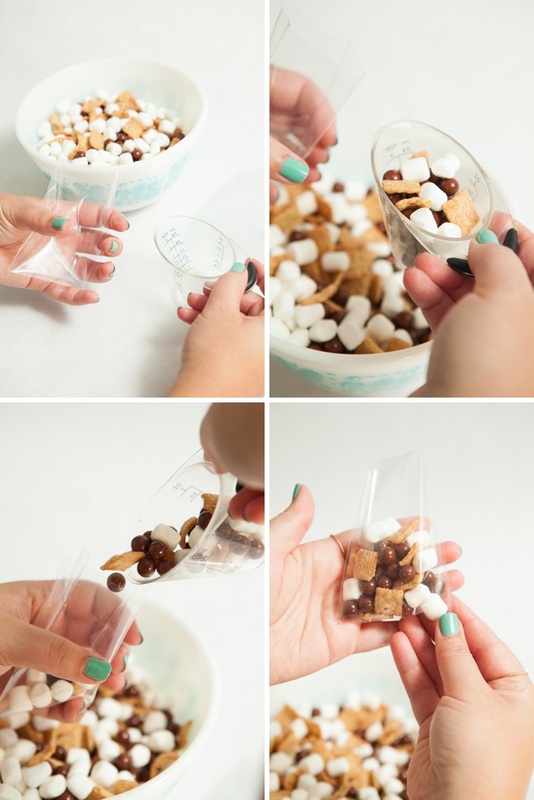 Fold the edges in first and then fold the top of the bag over itself and staple a few times. You want to get the best seal possible so your cereal doesn’t go stale. 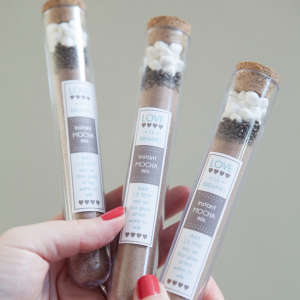 I would recommend making these as close to your event as possible, and of course – keep them out of the heat and sun! Download, edit and print my free design onto 8.5″ x 11″ cardstock. To edit, simply open the pdf. 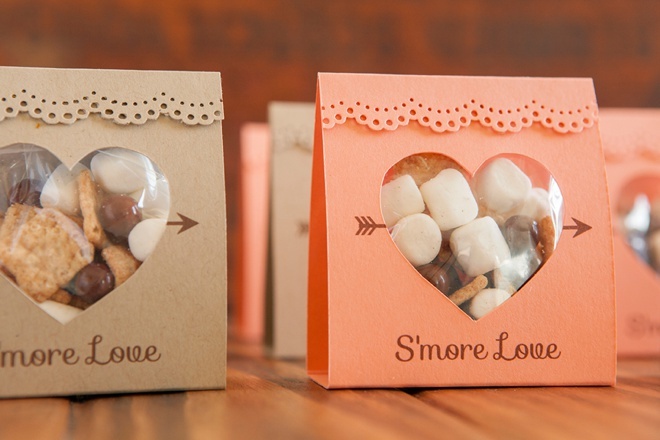 in either Adobe Reader or Adobe Acrobat and double click on the “S’more Love” box to add your own custom text! If you like the free font I used Sofia, you’ll need to download it before you edit the pdf. 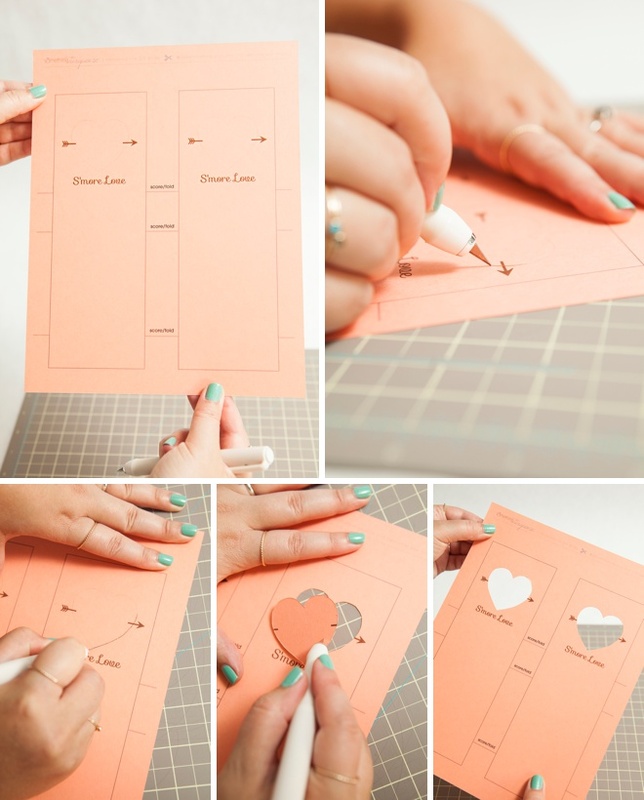 Using a craft knife, carefully cut out each heart design. Using a scoring board, line up the design and score on the lines provided. This is optional but will make your pouch look professional. You can also just fold on the lines. 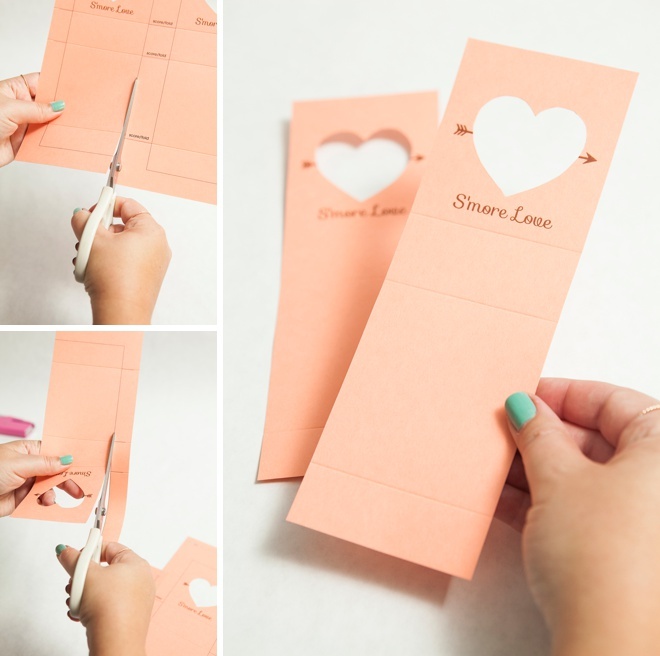 Once your heart and scoring is complete, cut out each card using scissors or a paper trimmer. 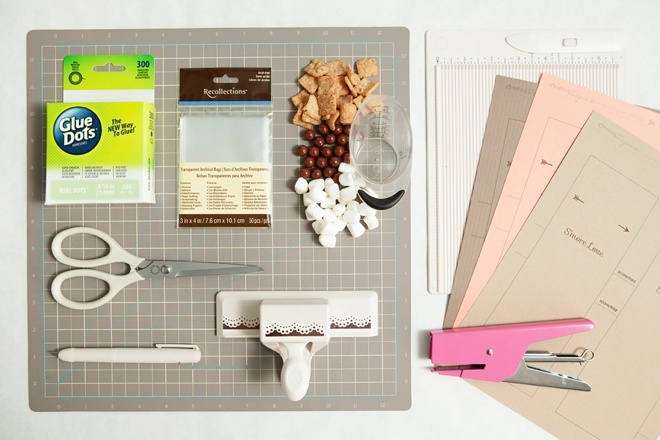 Using either an edge punch like this one from Martha Stewart or decorative scissors, punch across the bottom of the card – this ends up being the top flap. 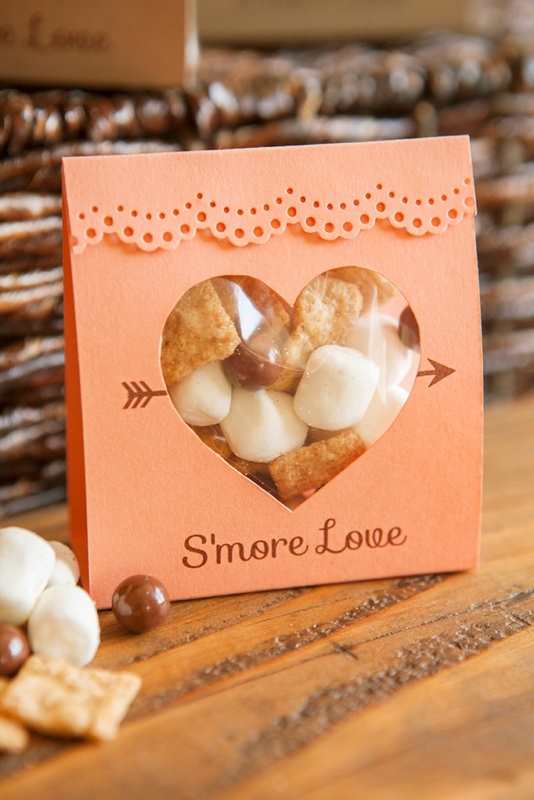 Set the s’mores bag right the middle of the folded card. 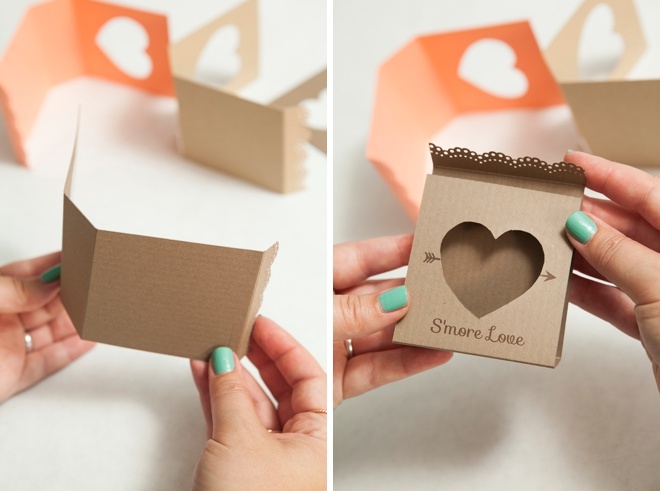 Fold the heart cut-out side up to the bag and staple. Add 3 Glue Dots right underneath the punched border. Fold the back side up and around. 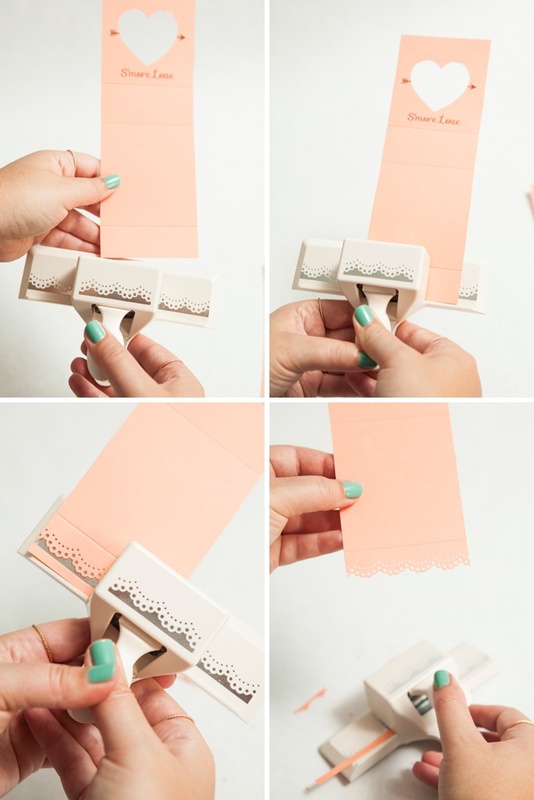 Fold the flap with the Glue Dots to cover the staples. 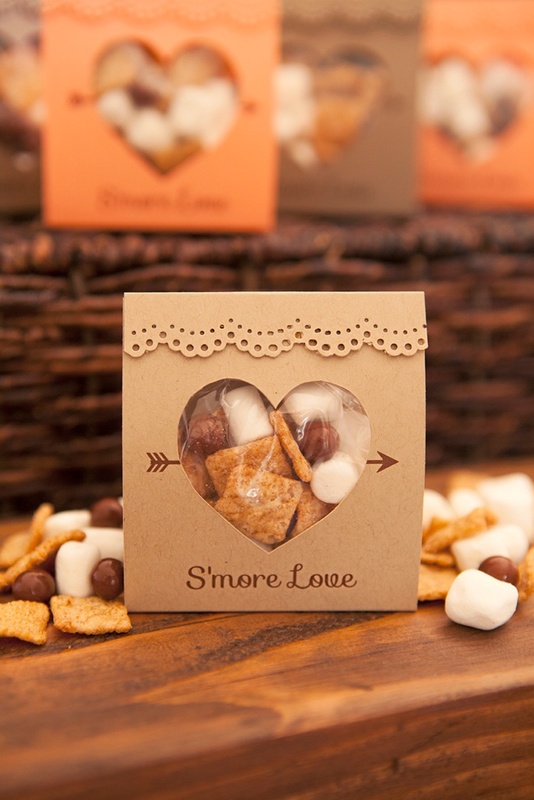 S’mores of all kinds are a popular favor and I think these are just perfect for your fall or winter wedding… how will you customize your favors to fit your event?? I’d love to hear! 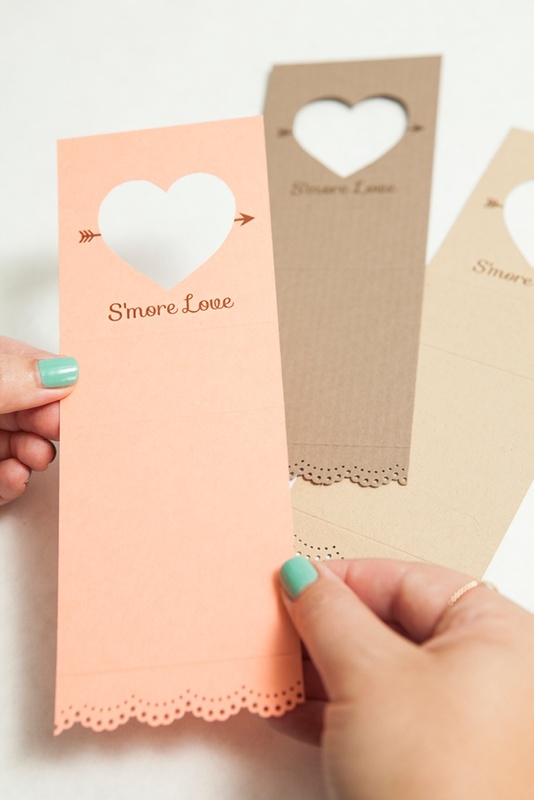 If you’d like to create a project similar to this using your Cricut Explore or Cricut Maker, you now can! We’ve created 4 free cut files that are waiting for you in Design Space!